Every day is an adventure in Arendelle! Elsa, Anna, Kristoff, Sven, and Olaf love to explore the world around them and fill their lives with the magic of friendship. 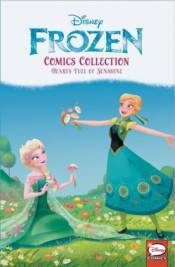 Experience all the wonder of Disney Frozen in this collection of beautiful and exciting comics. LITTLE MERMAID URSULA 5-STAR VINYL MARY POPPINS RETURNS MARY POPPINS & JACK VYNL. MINNIE MOUSE CUPCAKE KEEPSAKE MOANA MAUI AND MOANA VYNL. LILO & STITCH STITCH SEATED DIAMOND GLITTER US EXCLUSIVE POP! VINYL [RS] LILO & STITCH STITCH SEATED FLOCKED POP! LION KING MUFASA POP! LION KING NALA POP! LION KING SIMBA WITH BUG POP! LION KING TIMON LUAU POP!